We have released the first version of HTML5 Video Player couple of months ago. In the first version of this html5 video tool, the video looping feature was missing and many users requested to loop the HTML5 videos in their video gallery. Now you can loop HTML5 video display with the new feature on HTML5 Video Player V1.1. How to Loop HTML5 video? It is very easy to loop your HTML5 video now. 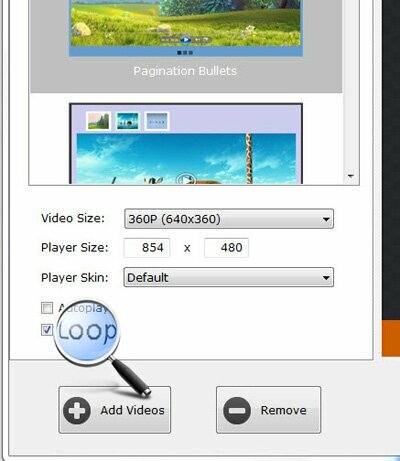 How to make your HTML5 video loop with HTML5 video player? You can simply drag and drop your source videos to the HTML 5 video player and converter. Or you can go to the Edit menu >> Add Videos to browse through your video library on your computer and select to add them to the HTML5 video tool. Go to the Theme tab from the main interface of the html5 video application. Here you have the chance to specify the video gallery template, customize player and/or video size/style, etc. Make sure to tick the Loop option if you want to make your html5 videos loop. Otherwise your videos will only play once, then stop, it will not repeat/replay automatically until your website visitors click the play control. Once you are ready with tuning the video player, click the Publish button to generate your HTML 5 video gallery. It will be saved in the Output Folder of the video tool on your hard disk. Go to the HTML5 menu, then choose Open Output Folder from the drop-down menu list. HTML5 video player make use of jQuery to create looping html5 video galleries. In a few clicks you have created stylish video gallery webpage with html5 videos loop continuously until your website visitors click the stop control. Now you are ready to publish your HTML5 video gallery to your website.